New features CSS3 today allow you to implement what had been possible to do only with the help of a graphical editor (eg, Photoshop). Therefore, the modern web designer enough to get acquainted with new features done, we must also review the approaches and learn how to creatively use these features. To develop these skills have always helped the analysis of practical examples. Want to find out how to create sophisticated seamless patterns? No problem! In this case you will provide invaluable assistance to the draftCSS3 Patterns Gallery . 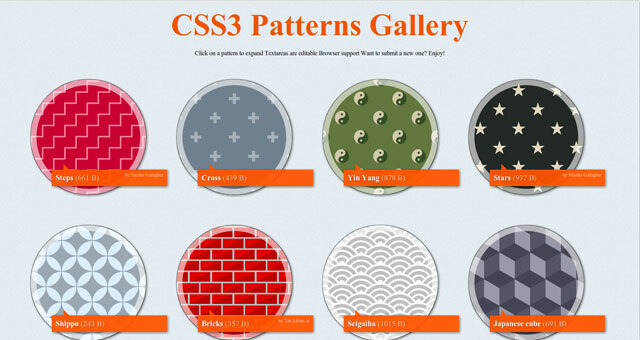 Gallery patterns CSS3 Patterns offers you 18 examples of virtuoso use of Cascading Style Sheets. Looking at some of them hard to believe that they were created solely by means of CSS, however, the way it is. There are backgrounds in the style of carbon fiber, brick walls and a checkerboard, as well as with stars, hearts and various bars and cells. And what is most interesting - these and other images are available through CSS turned off, even with the pictures in the browser. What can you do with this good? In its simplest form, just borrow a favorite pattern to use it in a proper project.But if you go ahead and take the time out to sort out how each pattern is created, then a lot to learn! A small technical comment about compatibility: in general, the patterns are well displayed on the IE 10, Firefox 3.6 +, Opera 11.10, and other modern browsers, however, sometimes some details may not display correctly. On older browsers (eg, Firefox 3.6 and below) the likelihood of problems a little higher. By the way, you can send your design to the site administrator, and if it is really interesting, it must be published.Learn new CSS features and show off your achievements!